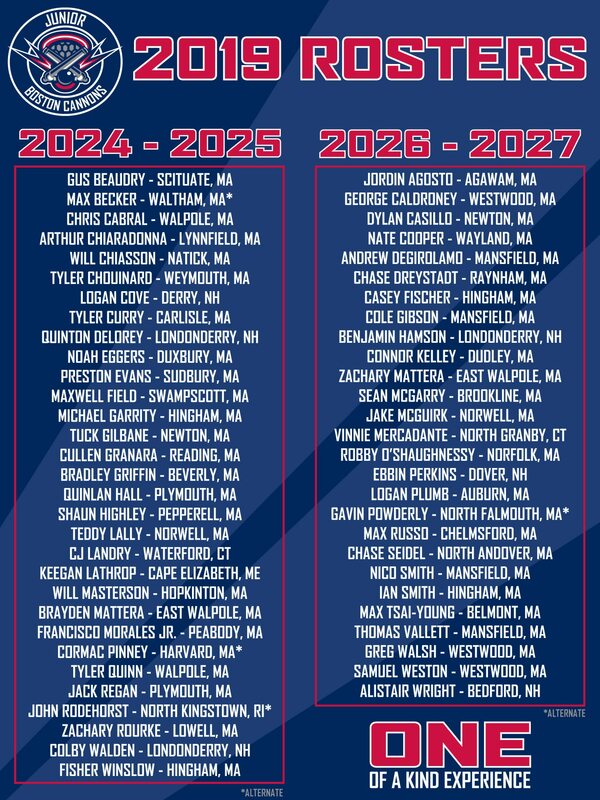 (QUINCY, MA) December 17, 2018 – The Boston Cannons of Major League Lacrosse (MLL) have released the names of the youth athletes who will be invited to join the Junior Cannons during its first season, set to begin play in the Summer of 2019. The Junior Cannons team is the first of its kind in the MLL and the coaches take great pride in their decisions, notifying all of the players prior to this announcement. "The Junior Cannons is a unique and exciting opportunity for players in New England," said Boston Cannons Head Coach Sean Quirk. "Equally, it is a thrill to be able to have youth players represent the Boston Cannons!" Head Coach Quirk and Assistant Coach Ben Rubeor compiled evaluations from three tryouts held across New England, where 288 athletes competed for a roster spot and a one-of-a-kind experience. With participation numbers so high, 118 towns across six states were represented and there were over 50 town or club programs mixed in. Coach Rubeor added, "This is a unique opportunity to bring together the best lacrosse players from across New England to give them a sense of what it’s like to play professional lacrosse. I hope that it is a small inspiration for these kids, whether they make the team or not, that playing professional lacrosse is possible, and it is worth the work that they put in." The Junior Cannons program will showcase the best youth lacrosse players in New England, with two teams suited up in official Boston Cannons uniforms. These players will have a unique opportunity to be coached by MLL coaches and compete against other top programs in the country. To learn more about the Junior Cannons, feel free to contact Bonnie Lattimore at blattimore@bostoncannons.com or CLICK HERE.